This past Wednesday we had the exciting opportunity to have Recoil magazine come and do a photo shoot at the Cody Firearms Museum. Editor of Recoil magazine, Iain Harrison, and photographer Kenda Lenseigne, will be writing an article featuring several firearms from our collection at the CFM. Iain is a competitive shooter and former British Army Captain, as well as the season 1 winner of the History Channel series Top Shot. Kenda is a World and National Champion Cowboy Mounted Shooter and spokesperson for multi-national branded companies. They were a pleasure to work with, and it was awesome to see just how passionate they were about the firearms we were able to pull out for the photo shoot. Not only were they able to get shots of frontier firearms such as Sam Colt’s 1851 Colt Navy’s and the Winchester 1866 World’s Fair repeater, but more modern firearms such as a Lewis Gun, a Browning Automatic Rifle, and a Winchester Liberator shotgun (to name a few). 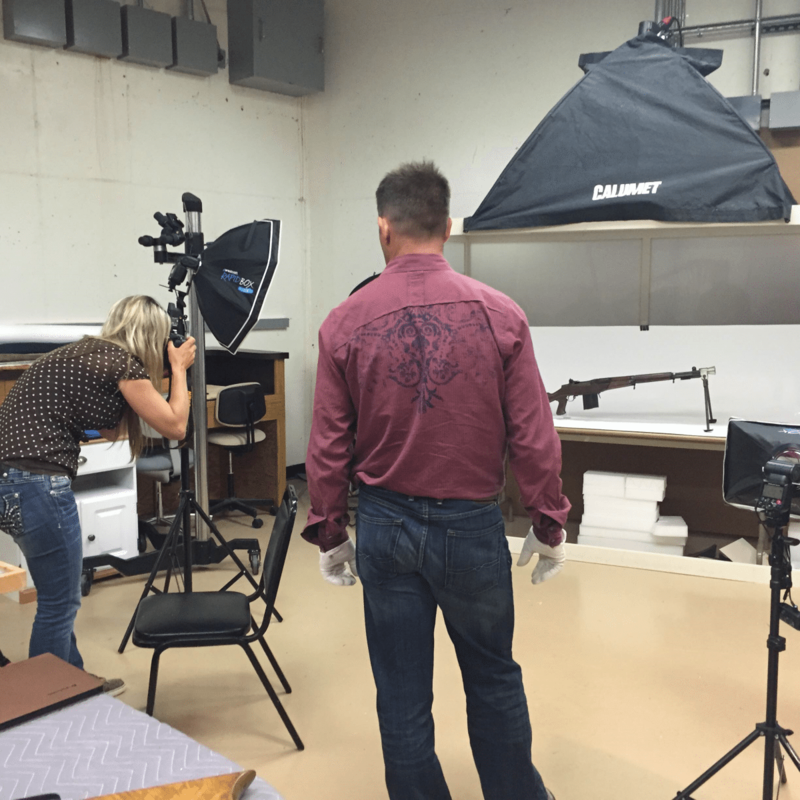 This photo shoot will not only be a great article for their upcoming issue, but will also illuminate the breadth of the collection we have at the Cody Firearms Museum. At the Buffalo Bill Center of the West, we have a mission to educate and inspire the public about the rich history of the American West. It should also be noted that our collection in the Cody Firearms Museum goes far beyond the history of the settling of the American Frontier. If it weren’t for the creativity and ingenuity of arms manufactures and gun makers of the 18th and 19th centuries, the modern firearms in our collection couldn’t exist. If you tour our galleries, you will notice that our collection covers military history and arms up to the Vietnam War. We have more firearms in our collection that extend beyond that timeline as well. The experience was quite an exciting task for my second week as an intern. Having the opportunity to only obtain these firearms from our automatic weapons vaults, and to see just how massive the collection is of modern firearms was incredible. Meeting Iain and Kenda, and experiencing the photo shoot, has been a highlight of my work here at the museum. As I continue to learn and research about firearms, it was fantastic to be able to ask questions and participate in a photo shoot for a firearms magazine, as well as being surrounded with those who share a passion for firearms and their history. Ryan Hodges is from Boones Mill, Virginia, and recently received his undergraduate degree in history with a concentration in public history from Roanoke College in Salem, Virginia. He is currently participating in an internship at the Cody Firearms Museum at the Buffalo Bill Center of the West. He posts daily about various firearms in the museum, creates text panels for various exhibits, and works with the firearms educational programming that includes gun safety.